McFadyen Group - If you are searching for plant hire Sunshine Coast then you should consider what McFadyen Group has to offer. Call us for information and quotes. If you are looking for plant hire Sunshine Coast, then don’t look past the trusted services of the McFadyen Group. We provide a wide range of equipment for hire available on the Sunshine Coast and surrounding areas. 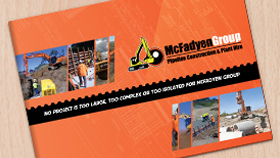 When it comes to the best machinery and equipment McFadyen has got you covered in all aspects. No job is too big or small for McFadyen, and we provide services for private and Government projects. We can provide services at any time and any location. Our equipment and machinery is made by the worlds most reputable and trusted brands and every piece is regularly inspected and serviced by our highly qualified technicians, who are also available to inspect and service on your project site also. If you would like to find out more about our services then please do not hesitate to contact us by email or phone. One of our friendly staff members will respond promptly, and are happy to answer any questions you may have about our products or if you require a quote.